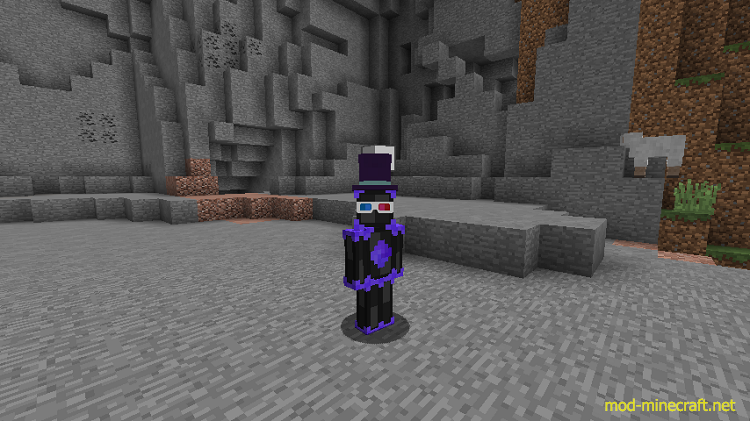 Wearables Mod adds many new wearable items, some of which have special functionalities and some which don’t. They can all be colored and combined to your own liking. Once you have your Wearable Fabricator, interacting with the block will bring a GUI. From here, you can select components to create by clicking the desired component slot, and scroll through them by dragging the scrollbar. Once selected, a preview will show up and an ingredient list will be provided. Input those ingredients to the bottom 4 slots, and the uncolored component item will be outputted. From the Colorizer GUI, you can input your Wearable Component into the middle slot. Once placed, a larger preview will show. The three sliders on the right can be dragged to change the RGB values for the currently selected layer. The tabs on the side can be used to select different layers of the component. Now, take your component out and move to the Wearable Assembler. The Wearable Assembler is crafted like this, with any wood or stone slab. Note: You cannot add two components of the same type, such as two glasses. Once you’ve inputted your components, you will see a preview of your wearable. You can either take the end result out, or customize it some more. 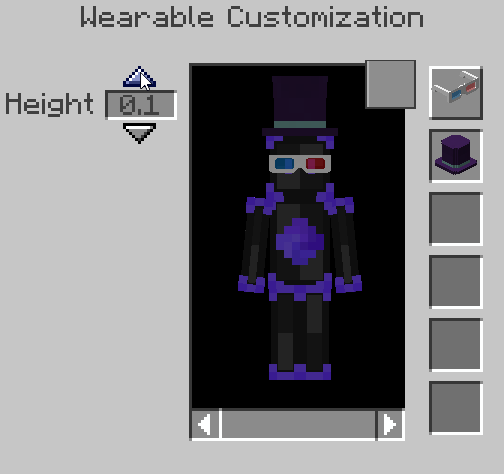 Firstly, you can apply armor to your wearable. Regularly, wearables do not protect you from any damage and do not have durability. When you apply an armor piece, the wearable will gain that damage protection and durability. Secondly, on some components you can customize the Height property. This specifies and offset on the Y axis for an individual component. Press the “…” button and it will take you to a new GUI. From here you can select individual components and adjust their properties. For example, you may want to align glasses with your skin eyes. To exit from this GUI, simply press ‘Escape’. Now, you can finally take the wearable out of the assembler and wear it for yourself. Once you take it out, it behaves just like regular armor. You can take it on and off like you normally would for armor. There are a few functional wearables currently in this mod. 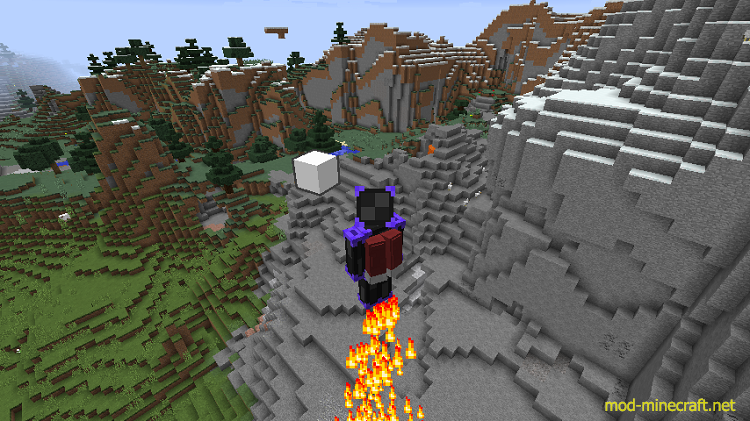 The jetpack works as would be expected, holding Jump allows you to fly. Pressing Forward allows you to move forward at quick speeds. In survival, however, you will require Jetpack Fuel. Once you have fuel in your inventory, you can fly with your jetpack. It will slowly be drained, so keep an eye on the fuel level! 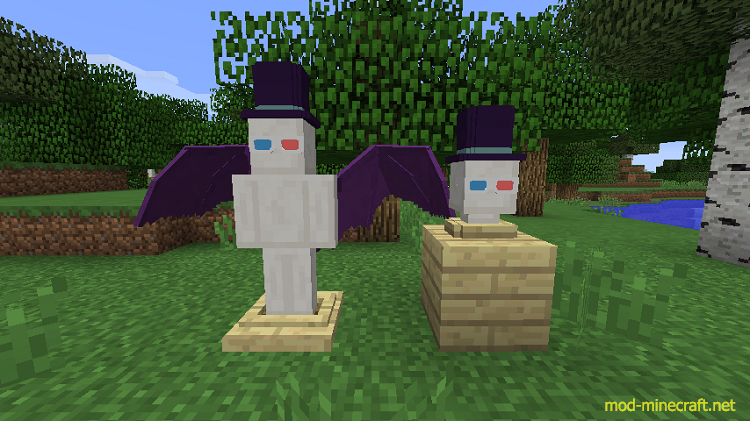 Wings work similarly to the Jetpack, they allow flight. 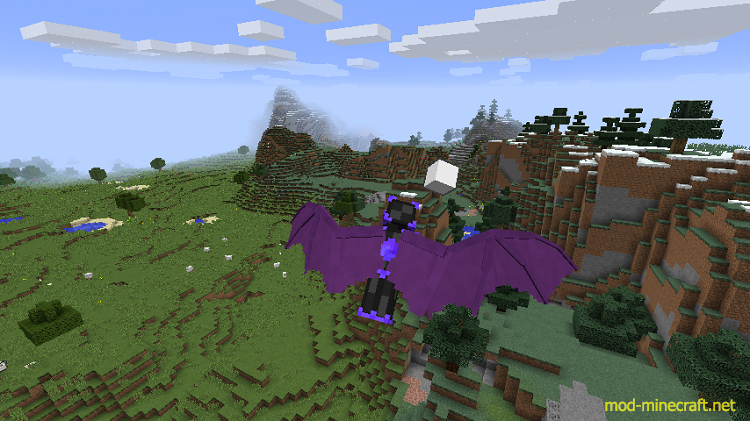 Although, wings do not require power like the Jetpack. They also provide slightly slower flight. Flippers make getting around in water much faster. On land, however, they slow you down. 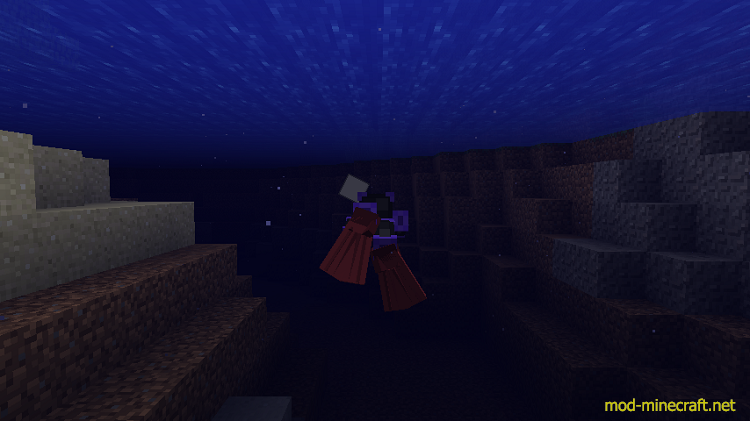 As soon as you get into two block deep water, you will move into swimming position. Here you can swim fast, with the help of your flippers. Night Vision Goggles work as you might expect. Putting them on at night will improve your visibility, but putting them on in the day will decrease your visibility. Now, you may want to display your beautiful wearable creations. This is possible with the Display Mannequin and Mannequin Head Stand. The regular Display Mannequin allows displaying of the all wearables, but the Mannequin Head Stand only displays head wearables. The Display Mannequin can have wearables added through a GUI (opened by interaction), and the head stand swaps wearables in your hand with a single interaction.